Unichamp Mineral Philippines, Inc., a mineral processing and environmental company, signed an agreement with ABS-CBN Lingkod Kapamilya Foundation-Bantay Kalikasan’s Bantay Langis and Bantay Baterya projects. The agreement aims to properly dispose hazardous wastes such as used lead acid batteries and used oils in Unichamp’s facility. “We supply treatment for wastewater. Basically, it’s limestone which we process into quicklime and finally, the milk of lime. I was impressed by the endeavour of Bantay Kalikasan and as an environmental protection company we would also like to support those who would like to protect the environment,” Romel Ibuna, Unichamp Mineral Philippines’ President enthused. “In our mineral processing permit, we are committed to the Mines and Geosciences Bureau to set aside a portion of our cost of production for the protection of the environment and community,” he added. 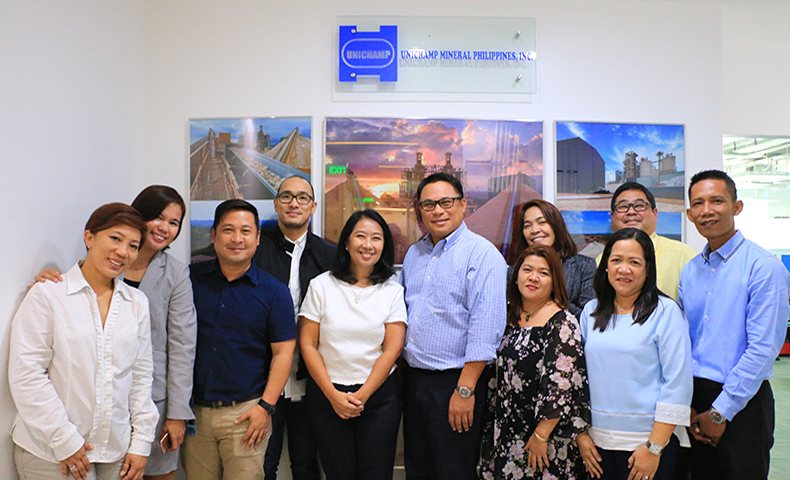 A group photo with Unichamp Mineral Philippines, Inc. headed by President Rommel Ibuna, and Unichamp Mineral Philippines' Finance & Admin. Manager, Hilda Quillo, with ABS-CBN Lingkod Kapamilya Foundation, Inc.’s Chief Finance & Services Officer, Noemi Samson, and ALKFI's Central Marketing Head, Paul Vincent Mercado. Together with them are Jocelyn Panen, Pollution Control Officer of Genetron International Marketing, and Rita Regalado, ULAB Supervisor of Oriental & Motolite Marketing who are the partners of Bantay Kalikasan in hauling and recycling used lead-acid batteries and used oils. The used oils and lead acid batteries will be collected and recycled by Genetron International Marketing and Oriental & Motolite Marketing, respectively. Its monetary value will be donated to ALKFI’s Bantay Baterya and Bantay Langis Project which will help support all the environmental advocacies of Bantay Kalikasan and its 14 assisted-communities in Iba, Zambales; San Ysiro, Antipolo; Pasig River; Lobo, Batangas; Oriental Mindoro; Sibuyan, Romblon; Samar; Leyte; Carles, Iloilo; Guimaras; Palawan; Sorsogon; Maguindanao; and Sarangani. Lime is used to make drinking water and improve its quality. It is also the most effective and cost efficient alkaline product that helps in treating wastewater.